Fish oil contains the omega-3 fatty acids docosahexaenoic acid (DHA) and eicosapentaenoic acid (EPA) which are generally anti-inflammatory. Because of the importance of proper modulation of inflammation and immunity, fish oil is thought to offer a range of health benefits. Fish oil might offer benefits for cardiovascular (heart) health,1, 2 although a recent Cochrane Review has noted little benefit for cardiovascular mortality overall. 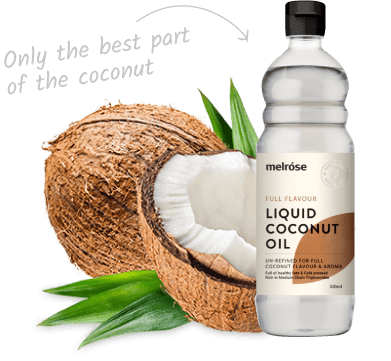 Medium chain triglycerides or MCTs are a particular type of lipid (fat) that are slightly shorter than normal dietary fats. Most fats in the diet contain chains greater than 14 carbons long, whereas the MCTs are between 6 and 10 carbon chains long. This gives them the ability to escape the usual digestion pathway and go directly to the liver where they are converted into bio-available ketone fuels.17-23 These ‘ketone bodies’ (usually just called ‘ketones’) can be used as a preferred fuel by most tissues in the body, even brain cells! Why should I take fish oil with MCTs? There are many benefits from both MCTs and fish oil, so, it makes sense to combine them for a range of outcomes including potential protective effects for cardiovascular and metabolic health, reducing body fat, reductions in inflammation, and for providing a readily digestible and usable fuel source also high in the omega-3 fatty acids that many people do not get enough of day-in and day-out. 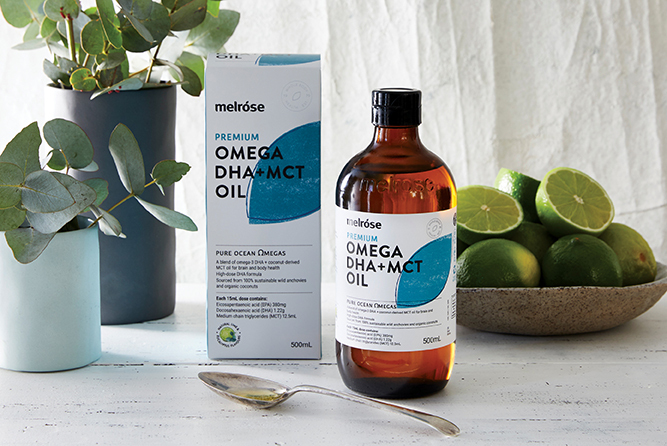 Both fish oil and MCT offer a range of benefits independently, and they might offer synergistic benefits for a range of outcomes, from brain health and cognition, through to cardiometabolic health, inflammation and immunity, and satiety and weight/fat-loss. The particular combination of DHA with MCT is likely to offer extensive benefits to brain health and function. 1. Wang C, Harris WS, Chung M, Lichtenstein AH, Balk EM, Kupelnick B, et al. n−3 Fatty acids from fish or fish-oil supplements, but not α-linolenic acid, benefit cardiovascular disease outcomes in primary- and secondary-prevention studies: a systematic review. The American Journal of Clinical Nutrition. 2006;84(1):5-17. 2. León H, Shibata MC, Sivakumaran S, Dorgan M, Chatterley T, Tsuyuki RT. Effect of fish oil on arrhythmias and mortality: systematic review. BMJ. 2008;337. 3. Montori VM, Farmer A, Wollan PC, Dinneen SF. Fish oil supplementation in type 2 diabetes: a quantitative systematic review. Diabetes Care. 2000;23(9):1407-15. 4. Eslick GD, Howe PRC, Smith C, Priest R, Bensoussan A. Benefits of fish oil supplementation in hyperlipidemia: a systematic review and meta-analysis. International Journal of Cardiology. 2009;136(1):4-16. 5. Zhu W, Dong C, Du H, Zhang H, Chen J, Hu X, et al. Effects of fish oil on serum lipid profile in dialysis patients: a systematic review and meta-analysis of randomized controlled trials. Lipids in Health and Disease. 2014;13(1):127. 6. Xin W, Wei W, Li X-Y. Short-term effects of fish-oil supplementation on heart rate variability in humans: a meta-analysis of randomized controlled trials. The American Journal of Clinical Nutrition. 2013;97(5):926-35. 7. Xin W, Wei W, Li X. Effects of fish oil supplementation on cardiac function in chronic heart failure: a meta-analysis of randomised controlled trials. Heart. 2012;98(22):1620-5. 8. Xin W, Wei W, Li X. Effects of fish oil supplementation on inflammatory markers in chronic heart failure: a meta-analysis of randomized controlled trials. BMC Cardiovascular Disorders. 2012;12(1):77. 9. Campbell F, Dickinson HO, Critchley JA, Ford GA, Bradburn M. A systematic review of fish-oil supplements for the prevention and treatment of hypertension. European Journal of Preventive Cardiology. 2012;20(1):107-20. 10. Manzanares W, Dhaliwal R, Jurewitsch B, Stapleton RD, Jeejeebhoy KN, Heyland DK. Parenteral Fish Oil Lipid Emulsions in the Critically Ill. Journal of Parenteral and Enteral Nutrition. 2014;38(1):20-8. 11. Wei C, Hua J, Bin C, Klassen K. Impact of lipid emulsion containing fish oil on outcomes of surgical patients: Systematic review of randomized controlled trials from Europe and Asia. Nutrition. 2010;26(5):474-81. 12. Manzanares W, Langlois PL, Dhaliwal R, Lemieux M, Heyland DK. Intravenous fish oil lipid emulsions in critically ill patients: an updated systematic review and meta-analysis. Critical Care. 2015;19(1):167. 13. Gao H, Geng T, Huang T, Zhao Q. Fish oil supplementation and insulin sensitivity: a systematic review and meta-analysis. Lipids in Health and Disease. 2017;16(1):131. 14. Turner D, Shah PS, Steinhart AH, Zlotkin S, Griffiths AM. Maintenance of remission in inflammatory bowel disease using omega-3 fatty acids (fish oil): A systematic review and meta-analyses. Inflammatory Bowel Diseases. 2011;17(1):336-45. 15. He L, Li M-s, Lin M, Zhao T-y, Gao P. Effect of fish oil supplement in maintenance hemodialysis patients: a systematic review and meta-analysis of published randomized controlled trials. European Journal of Clinical Pharmacology. 2016;72(2):129-39. 16. Moloudizargari M, Mortaz E, Asghari MH, Adcock IM, Redegeld FA, Garssen J. Effects of the polyunsaturated fatty acids, EPA and DHA, on hematological malignancies: a systematic review. Oncotarget. 2018;9(14):11858-75. 17. Bach A, Schirardin H, Weryha A, Bauer M. Ketogenic response to medium-chain triglyceride load in the rat. J Nutr. 1977;107(10):1863-70. 18. Yeh YY, Zee P. Relation of ketosis to metabolic changes induced by acute medium-chain triglyceride feeding in rats. The Journal of nutrition. 1976;106(1):58-67. 19. St-Onge M-P, Ross R, Parsons WD, Jones PJH. Medium-chain triglycerides increase energy expenditure and decrease adiposity in overweight men. Obes Res. 2003;11(3):395-402. 20. Mingrone G, Greco AV, Castagneto M, De Gaetano A, Tataranni PA, Raguso C. Kinetics and thermogenesis of medium-chain monocarboxylic and dicarboxylic acids in man: sebacate and medium-chain triglycerides. JPEN Journal Of Parenteral And Enteral Nutrition. 1993;17(3):257-64. 21. Jiang ZM, Zhang SY, Wang XR, Yang NF, Zhu Y, Wilmore D. A comparison of medium-chain and long-chain triglycerides in surgical patients. Annals Of Surgery. 1993;217(2):175-84. 22. Lai H, Chen W. Effects of medium-chain and long-chain triacylglycerols in pediatric surgical patients. Nutrition. 2000;16(6):401-6. 23. Sandström R, Hyltander A, Körner U, Lundholm K. Structured triglycerides were well tolerated and induced increased whole body fat oxidation compared with long-chain triglycerides in postoperative patients. JPEN Journal Of Parenteral And Enteral Nutrition. 1995;19(5):381-6. 24. Huttenlocher PR. Ketonemia and seizures: Metabolic and anticonvulsant effects of two ketogenic diets in childhood epilepsy. Pediatr Res. 1976;10(5):536-40. 25. Huttenlocher P, Wilbourn A, Signore J. Medium‐chain triglycerides as a therapy for intractable childhood epilepsy. Neurology. 1971;21(11):1097-. 26. Harvey CJdC, Schofield GM, Williden M, McQuillan JA. The Effect of Medium Chain Triglycerides on Time to Nutritional Ketosis and Symptoms of Keto-Induction in Healthy Adults: A Randomised Controlled Clinical Trial. J Nutr Metab. 2018;2018:9. 27. Dulloo AG, Fathi M, Mensi N, Girardier L. Twenty-four-hour energy expenditure and urinary catecholamines of humans consuming low-to-moderate amounts of medium-chain triglycerides: a dose-response study in a human respiratory chamber. Eur J Clin Nutr. 1996;50(3):152-8. 28. St-Onge M-P, Ross R, Parsons WD, Jones PJH. Medium-Chain Triglycerides Increase Energy Expenditure and Decrease Adiposity in Overweight Men. Obesity Research. 2003;11(3):395-402. 29. Tsuji H, Kasai M, Takeuchi H, Nakamura M, Okazaki M, Kondo K. Dietary Medium-Chain Triacylglycerols Suppress Accumulation of Body Fat in a Double-Blind, Controlled Trial in Healthy Men and Women. The Journal of Nutrition. 2001;131(11):2853-9. 30. St-Onge M-P, Bosarge A. Weight-loss diet that includes consumption of medium-chain triacylglycerol oil leads to a greater rate of weight and fat mass loss than does olive oil. The American Journal of Clinical Nutrition. 2008;87(3):621-6. 31. Clegg ME. Medium-chain triglycerides are advantageous in promoting weight loss although not beneficial to exercise performance. International journal of food sciences and nutrition. 2010;61(7):653-79. 32. Van Wymelbeke V, Himaya A, Louis-Sylvestre J, Fantino M. Influence of medium-chain and long-chain triacylglycerols on the control of food intake in men. The American Journal of Clinical Nutrition. 1998;68(2):226-34. 33. Henderson ST. Ketone Bodies as a Therapeutic for Alzheimer's Disease. Neurotherapeutics. 2008;5(3):470-80. 34. Reger MA, Henderson ST, Hale C, Cholerton B, Baker LD, Watson GS, et al. Effects of β-hydroxybutyrate on cognition in memory-impaired adults. Neurobiology of Aging. 2004;25(3):311-4. 35. Cunnane SC, Courchesne-Loyer A, St-Pierre V, Vandenberghe C, Pierotti T, Fortier M, et al. Can ketones compensate for deteriorating brain glucose uptake during aging? Implications for the risk and treatment of Alzheimer's disease. Annals of the New York Academy of Sciences. 2016;1367(1):12-20. 36. Hauenschild A, Bretzel RG, Schnell-Kretschmer H, Kloer HU, Hardt PD, Ewald N. Successful Treatment of Severe Hypertriglyceridemia with a Formula Diet Rich in Omega–3 Fatty Acids and Medium-Chain Triglycerides. Annals of Nutrition and Metabolism. 2010;56(3):170-5. 37. Yusoff Y, Liang YS, Taat FG, Lin KK. The use of omega-3 free fatty and medium chain triglycerides in combination with GLP1 and SGLT2 in the management of obesity and severe refractory hypertriglyceridaemia. 2015. 38. Kondreddy VKR, Anikisetty M, Naidu KA. Medium-chain triglycerides and monounsaturated fatty acids potentiate the beneficial effects of fish oil on selected cardiovascular risk factors in rats. The Journal of Nutritional Biochemistry. 2016;28:91-102. 39. Carlson SJ, Nandivada P, Chang MI, Mitchell PD, O’Loughlin A, Cowan E, et al. The addition of medium-chain triglycerides to a purified fish oil-based diet alters inflammatory profiles in mice. Metabolism. 2015;64(2):274-82. 40. Assisi A, Banzi R, Buonocore C, Capasso F, Muzio VD, Michelacci F, et al. Fish oil and mental health: the role of n-3 long-chain polyunsaturated fatty acids in cognitive development and neurological disorders. International Clinical Psychopharmacology. 2006;21(6):319-36. 41. Jackson PA, Deary ME, Reay JL, Scholey AB, Kennedy DO. No effect of 12 weeks' supplementation with 1 g DHA-rich or EPA-rich fish oil on cognitive function or mood in healthy young adults aged 18–35 years. British Journal of Nutrition. 2012;107(8):1232-43. 42. Lee LK, Shahar S, Chin A-V, Yusoff NAM. Docosahexaenoic acid-concentrated fish oil supplementation in subjects with mild cognitive impairment (MCI): a 12-month randomised, double-blind, placebo-controlled trial. Psychopharmacology. 2013;225(3):605-12. 43. O'Connor EM, Power SE, Fitzgerald GF, O'Toole PW. Fish-oil consumption is inversely correlated with depression and cognition decline in healthy Irish elderly adults. Proceedings of the Nutrition Society. 2012;71(OCE2):E151. 44. Daiello LA, Gongvatana A, Dunsiger S, Cohen RA, Ott BR. Association of fish oil supplement use with preservation of brain volume and cognitive function. Alzheimer's & Dementia. 2015;11(2):226-35. 45. Matsuo J, Ashida K, Hattori K, Kunugi H, Ota M, Takahashi T, et al. PT599. Effect of single ketogenic diet containing medium chain triglycerides on cognitive functions in elderly adults. International Journal of Neuropsychopharmacology. 2016;19(Suppl 1):20-. 46. Ghasemi Fard S, Wang F, Sinclair AJ, Elliott G, Turchini GM. How does high DHA fish oil affect health? A systematic review of evidence. Critical Reviews in Food Science and Nutrition. 2018:1-44. 47. Hosseini B, Nourmohamadi M, Hajipour S, Taghizadeh M, Asemi Z, Keshavarz SA, et al. The Effect of Omega-3 Fatty Acids, EPA, and/or DHA on Male Infertility: A Systematic Review and Meta-analysis. Journal of Dietary Supplements. 2018:1-12. 48. Norman S, Edward BN, Erin Cernkovich B, Connye NK. The Relationship of Docosahexaenoic Acid (DHA) with Learning and Behavior in Healthy Children: A Review. Nutrients. 2013;5(7):2777-810. 49. Daiello LA, Wellenius G, Ott BR, Buka SL. Role of supplemental docosahexaenoic acid (DHA) for cognition in Alzheimer's disease and mild cognitive impairment: A&#xa0;systematic review and meta-analysis of randomized controlled trials. Alzheimer's & Dementia: The Journal of the Alzheimer's Association. 2015;11(7):P611. 50. Newell M, Baker K, Postovit L, Field C. A Critical Review on the Effect of Docosahexaenoic Acid (DHA) on Cancer Cell Cycle Progression. International Journal of Molecular Sciences. 2017;18(8):1784.